The Littlemill distillery was rumoured to be Scotland’s oldest, and possibly even the oldest in the world. While we’ll never know the precise truth of these claims, there’s no doubting the distillery’s long and fascinating history. Littlemill was producing whisky legally in 1772, when owner George Buchanan of Glasgow built accommodation for the excisemen. In a less official capacity the site – formerly a brewery attached to Dunglass Castle – may have been used for distilling liquor since the early 14th century. It was the owners of the Littlemill Distillery, Barton Brands, who created the Loch Lomond Malt distillery in 1965. 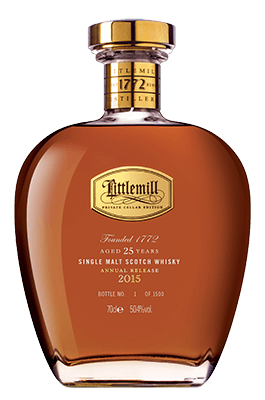 Littlemill passed through the hands of several individuals and businesses until it was acquired by Glen Catrine in the 1990s. However the distillery fell silent in 1994 and was destroyed by fire in 2004, never to produce a drop again. Happily, the spirit lives on in our sought-after bottlings. Rare amongst Lowland malts in using a Highland water source, as well as peat from Stornoway and Perthshire, Littlemill is known for a subtly floral, vanilla-rich sweetness. 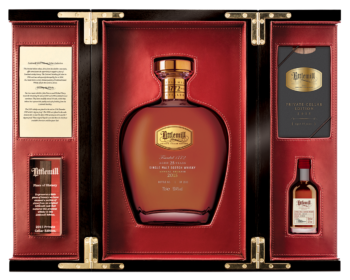 A sip of this fine whisky is more than just a memorable pleasure. It is a unique and historic experience.